We are a young family, with four children, living in the small town of Springville in beautiful Southern Indiana where there are more cows than there are people. Anyways, the thought of raising chickens and eating fresh eggs has always been intriguing to me. So a few years ago I began feeding my spark of curiosity by researching the subject (Thanks, BYC, for being such a huge resource). The more I learned about chickens the more I wanted try it for myself. 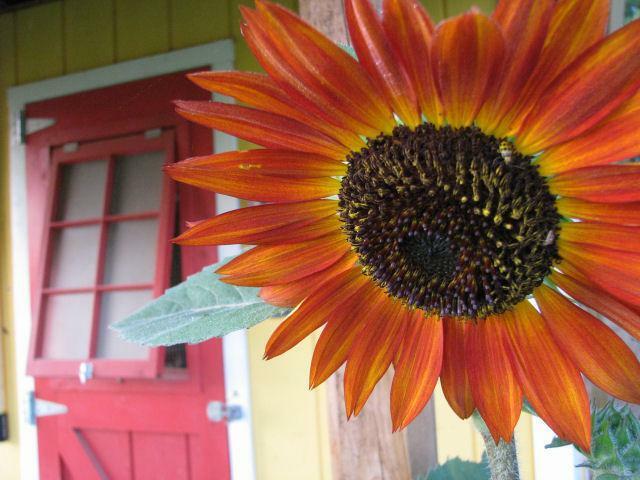 Our journey began when a box with the 2 dozen fertilized eggs I ordered was delivered to our house. “You ordered what?” my wife questioned. “We’re going to raise chickens, Baby”, I replied. She wasn’t too warm to the idea initially, but she loves them now. I bought the eggs because I wanted to start from the ground up, plus I thought it would be fun for our kids to see the chicks hatch. Seven healthy chicks hatched from the eggs, and then we bought a dozen more chicks from a local farm store. We kept the chicks in a homemade brooder in our garage while they were small. I knew it wouldn’t be long before they would outgrow the brooder and need a coop along with some space outside to scratch and roam about. So as soon as the ground thawed in the spring, I set out to build the chicks a place they could call home. 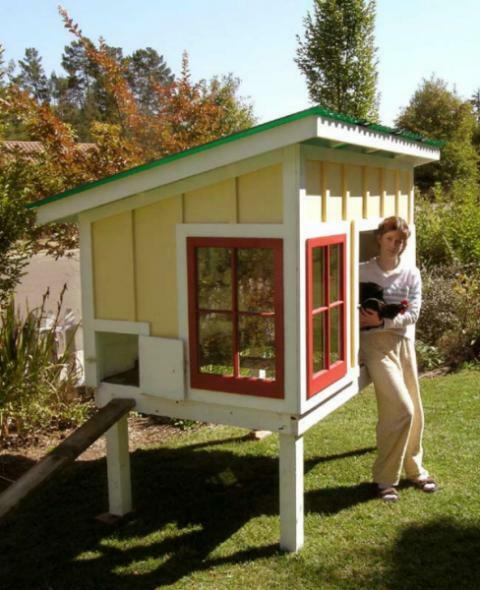 Several months prior to this point I had been busy designing the chicken coop. 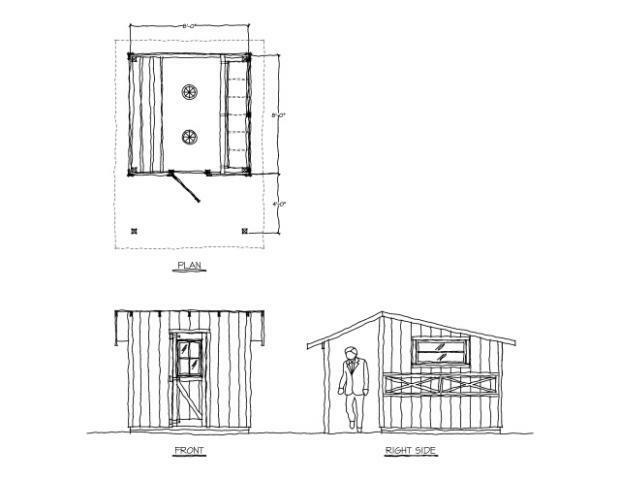 I don’t like to just throw things together, all options needed to be considered, blueprints drawn up, and a detailed construction process laid out (it's a curse that comes along with being a draftsman). So by the time the chicks finally hatched, I had everything planned out. Here are some of different things I considered during the design process. Aesthetics were very important to me. The coop had to look nice (I do have a little pride), and I wanted it to have an authentic, warm, country feel, not a pre-fab, plastic look. It also had to have a cool front door. 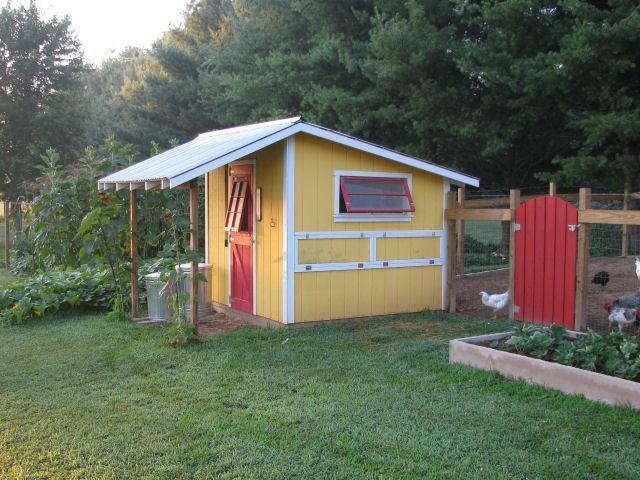 Below are some pictures of chicken coops I found online that influenced my final design. 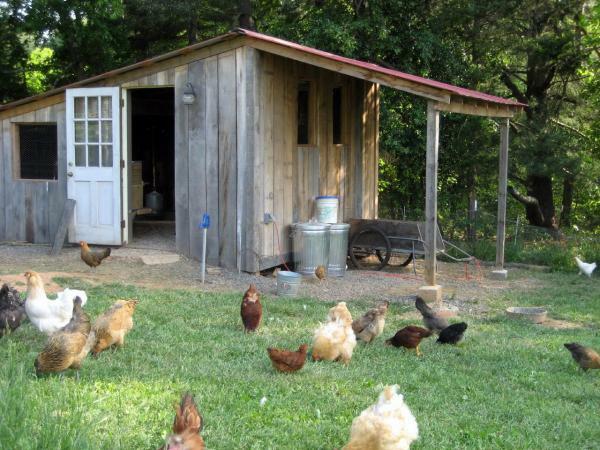 I tried to in-coop-orate what I thought were the most desirable features of these coops into my coop design. Click to enlarge. Outside access to the nest boxes so eggs could be gathered without having to go inside the coop. 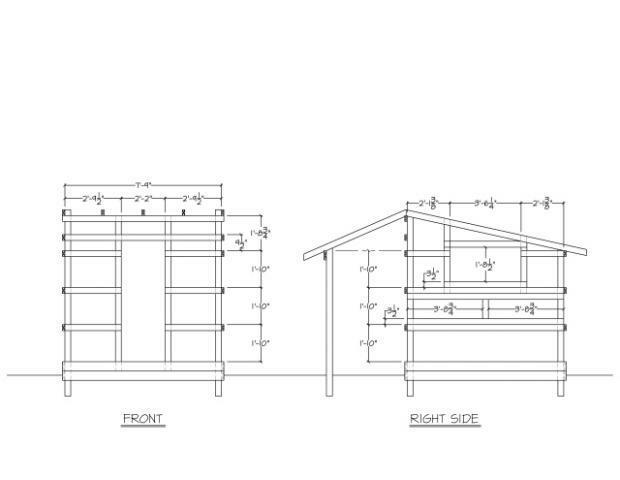 A covered front porch to help keep mud/snow away from the front door and provide additional storage space if necessary. 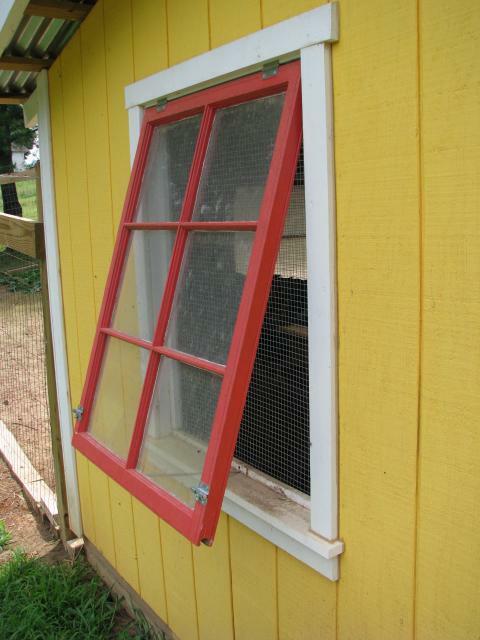 The ability to open, close, and lock the chicken door from the front of the coop. 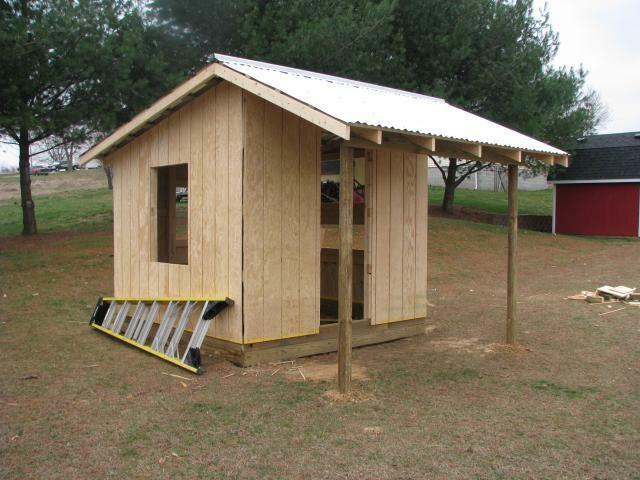 I wanted the coop to be large enough for me to able to walk around on the inside to make cleaning easier. Plenty of ventilation at the eves and fully functional windows for added ventilation during the summer months. A floor other than dirt to keep the litter dry and make it easier to clean out. 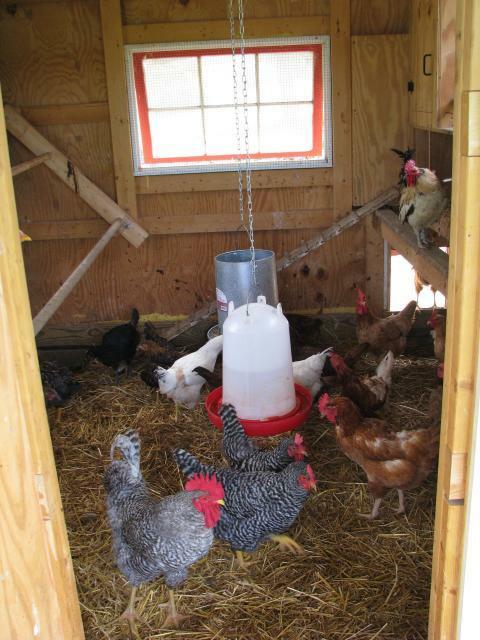 Currently, the coop has a dirt floor with straw used as litter. I came across some scrap limestone pavers that I plan on using for the floor as soon as I get around to it. 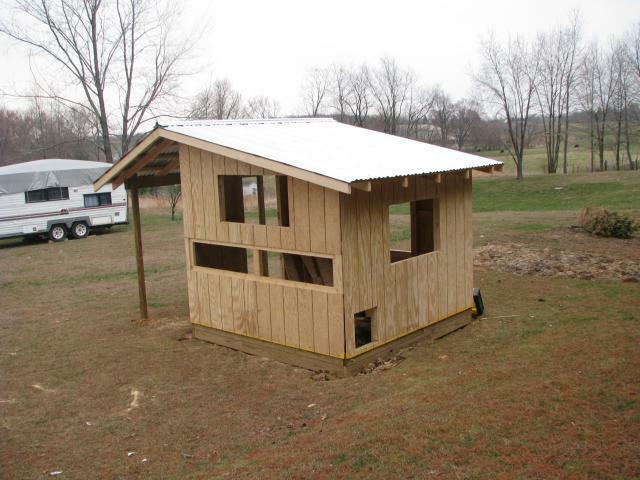 The Size of the coop needed to accommodate up to 25 hens comfortably, now I wish I would have made it bigger. Cost wasn’t a huge concern. 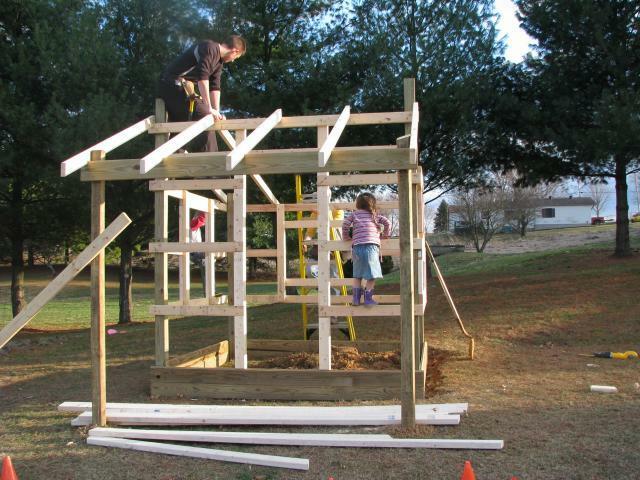 Keeping the total construction cost around $750 sounded reasonable to me. I didn’t keep good financial records for two reasons, 1) I didn’t want to feel bad if I went over my target, and 2) I didn’t want my wife to know how much money I was sinking into it. 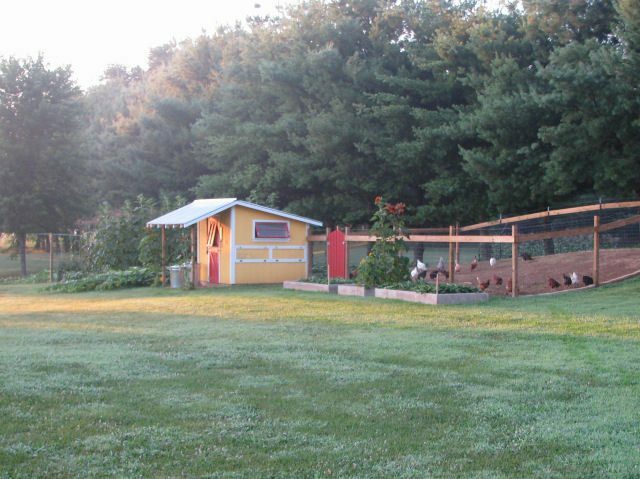 In retrospect, I wish that I would have incorporated a mobile fence design or multiple run areas so the hens could have fresh grass and bugs to forage through daily. They get plenty of leftover kitchen scraps and garden remnants, however, alternatives to permanent fencing will certainly be considered on the next go around. After I decided what features I wanted and had the basic concept figured out I started putting it all together on paper. 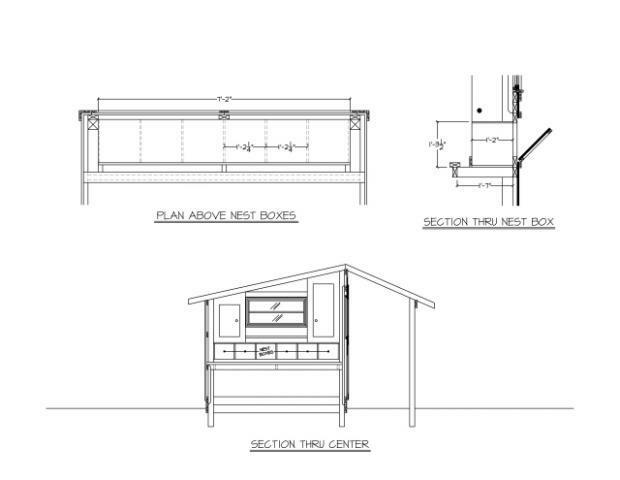 Below are some of the construction drawings I generated for the coop. Click to enlarge. 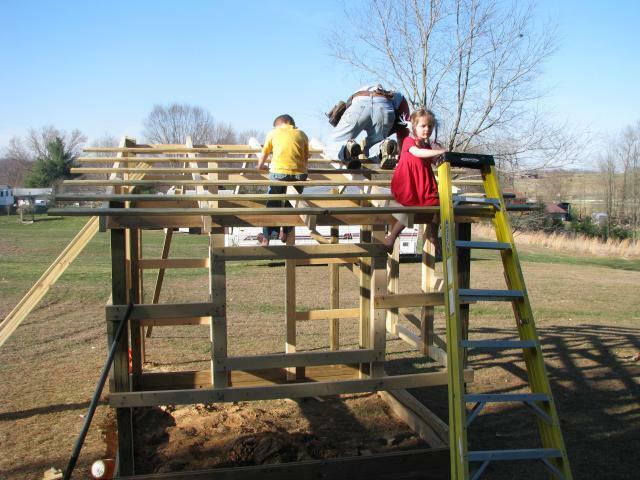 Construction started early March 2010 and with the help of my kids, wife, and a neighbor boy the coop was finished by mid-April. 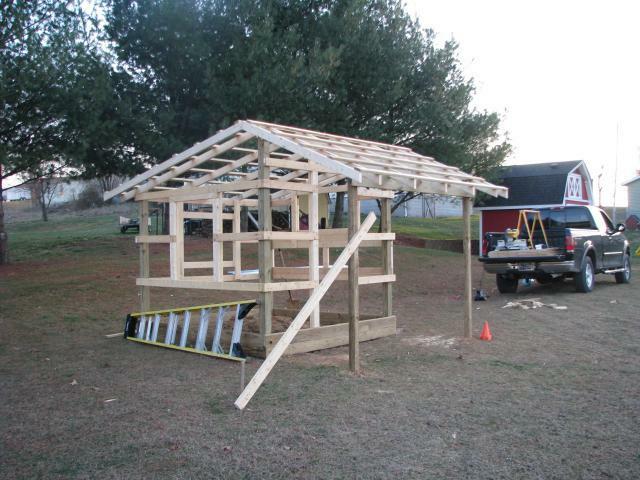 Here are some pictures of the construction process. 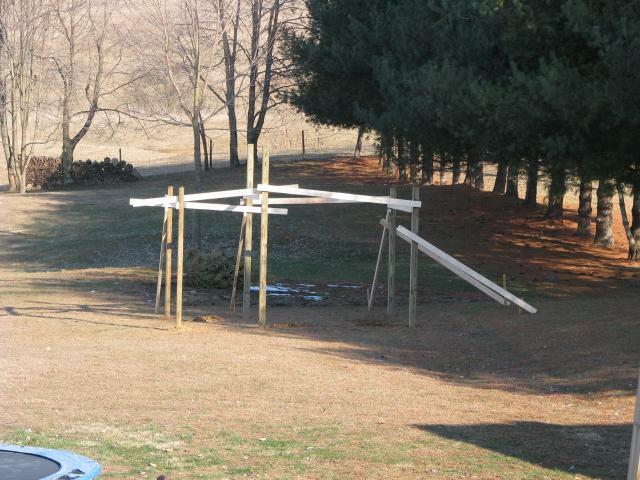 The posts set and braced. 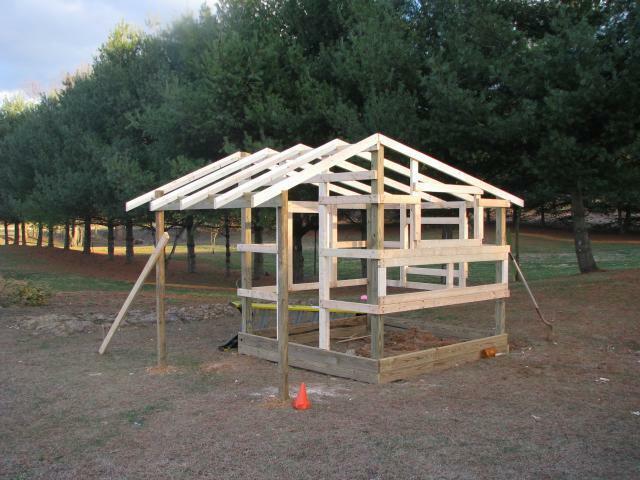 Nailing down the roof purlins. Ready for the door and windows. I found these old window sashes in the basement of a local antique shop. I built new frames to fit them, then added hardware and red paint. They turned out pretty nice, and really help with ventilation during the hot summer months. 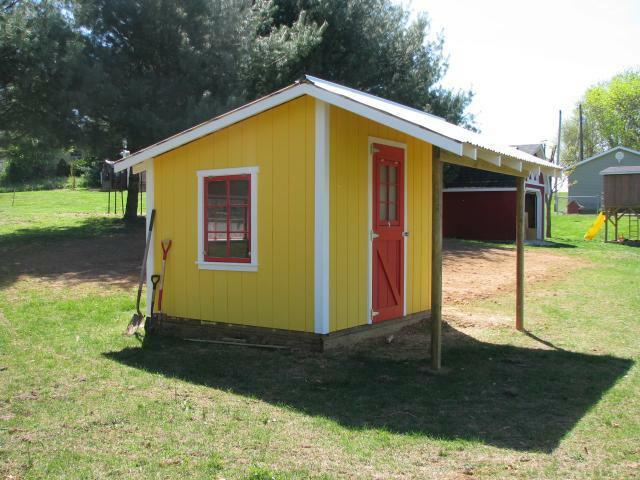 Here's the coop with the door, windows, and paint. 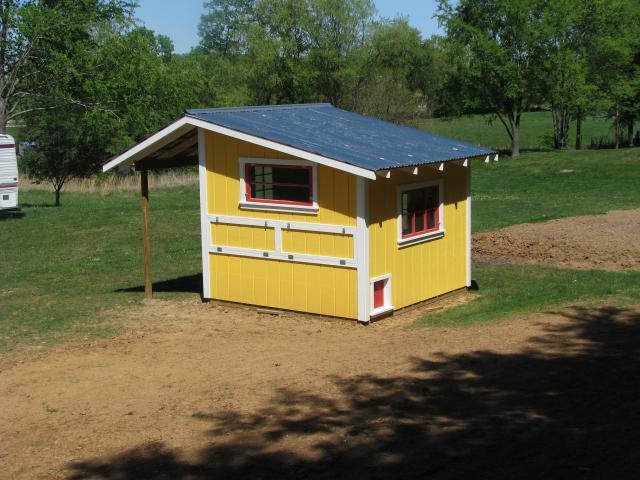 Here are some pictures of the finished coop and pen. Enjoy! 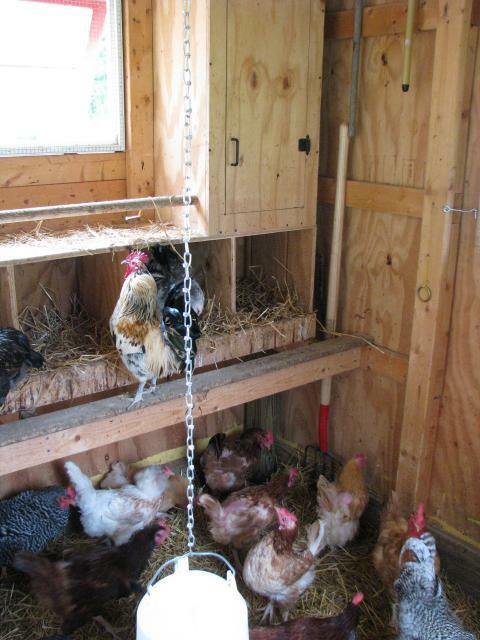 Here's a shot of rope/pulley system I rigged up to open/close and lock the small chicken door on the back of the coop. I modified a hold-down clamp, added a spring and a few other misc. items to make the locking mechinism. 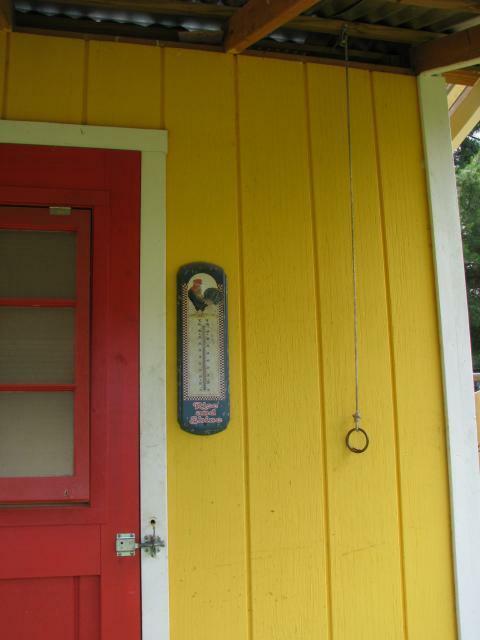 It works great, now the only way the chicken door can be unlocked/opened is by pulling this string. Now, if I could just get in the habit of closing the door at night we'd be in good shape. Hope you found this narrative helpful and enjoyable. Best regards. Really good job on this coop and run. Also good job on writing so that others may be able to follow your design. The wall framing is a bit unconventional. It seems to be working well though. 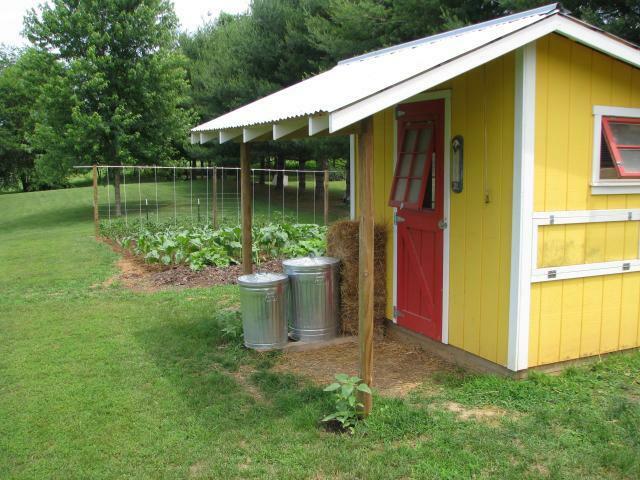 I love the design of this coop. 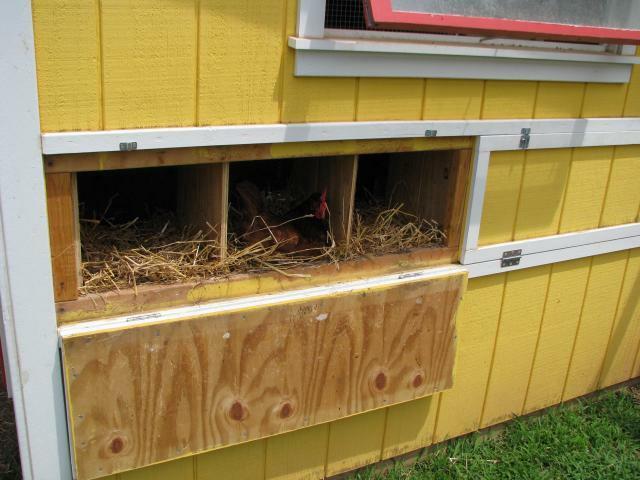 I also really appreciate that there is more than enough ventilation on this coop and that the run is a good size. I would recommend covering the run, though. I also like how there are plenty of windows to let in light. Thanks for the comments everyone. Orpington13 - I was worried about hawks initially but never lost any of my birds to them. O.K. now I neeeeed to move and get a bigger place. What a great coop! Did you ever have nay predator problems? The back run looks a little open, perfect for a hawk. 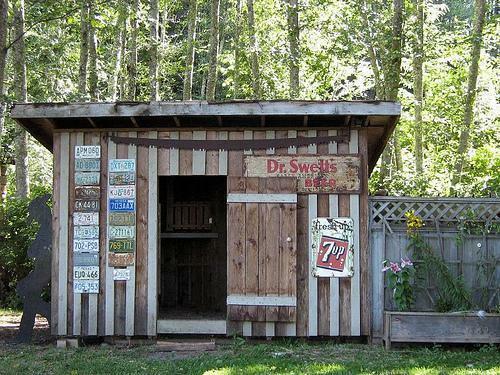 You have a very nice, well-thought out coop. I love the color scheme. "They say" 1.5-2sqft floor space per bird. We have 8 older hens in a 6'x8' coop. When it's raining or cold and they stay in all day, they do ok. However, we have 24 chicks that are taking over that coop in a few months and, according to the experts, it's just the right size. 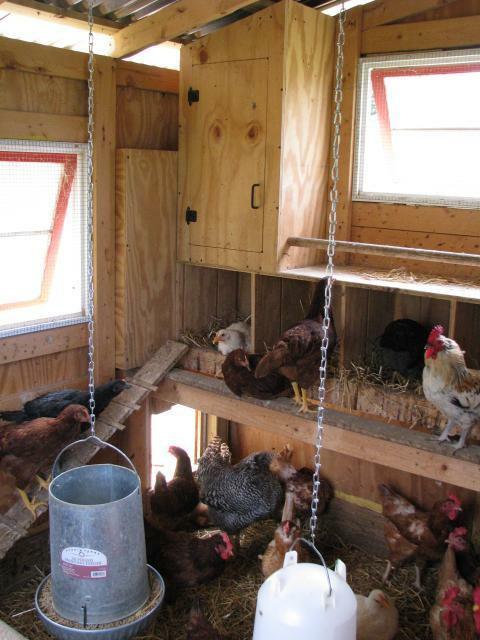 I could NOT imagine all 24 birds stuck inside a 6'x8' coop all winter!!! So ... we are either remodeling or starting over. Thanks so much for the detailed post! It has given me good ideas. Very nice. I like the yellow. Looks like you need to add on. Pretty crowded in there! 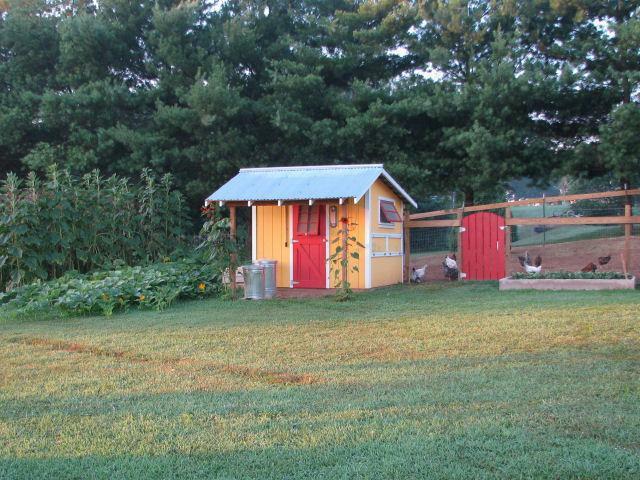 Thanks Sadie57, We really love the coop, and I think the chickens do to. I have never lost a chicken to a predator in this coop/run. The neighbors have two dogs and we had one. I did place limestone bricks around the bottom edge of the fencing to fill in any gaps. Love your country design, and everything looks so neat in the pictures. Do you have trouble with neighbors dogs or snakes, coyotes, etc? Was wondering if we should do something more secure with the run to prevent predators from digging in. Patsy - thanks for your kind comments and your're welcome. We love the coop and the old windows add a nice touch and work great, plus like you said, we were recycling...win, win, win. Thanks Happy Dad, and you're definitely welcome. ChickWHorses - I'm no expert, but I think I would insulate well and use a heat lamp during the extremely cold months. Also, don't forget to allow for good ventilation, it is necessary during both the hot and cold seasons. 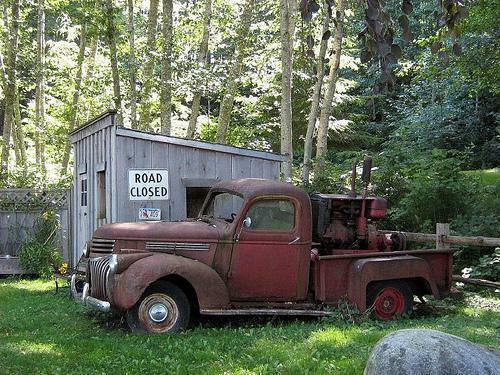 We live in the Okanagan in the interior of British Columbia, Canada. Can anyone give me advice on whether insulating the walls would be necessary here. We get down to maybe -30 Celsius to +40 Celsius. We get quite a bit of snow. We LOVE this design. 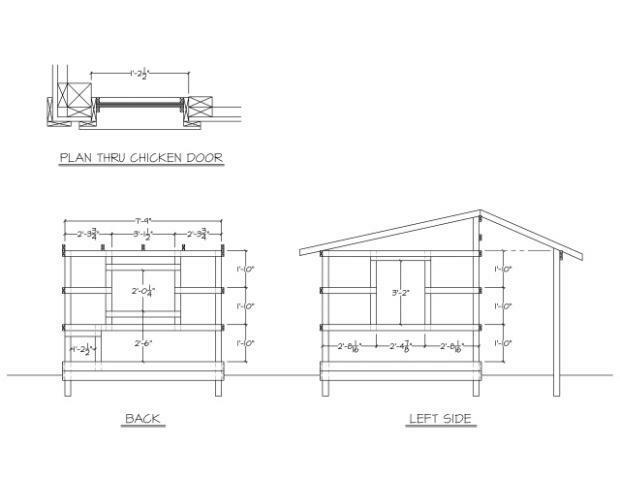 Thanks for sharing as we are going to base our coop off of your design. Well done! I really like your coop! Thanks so much for all the photos. 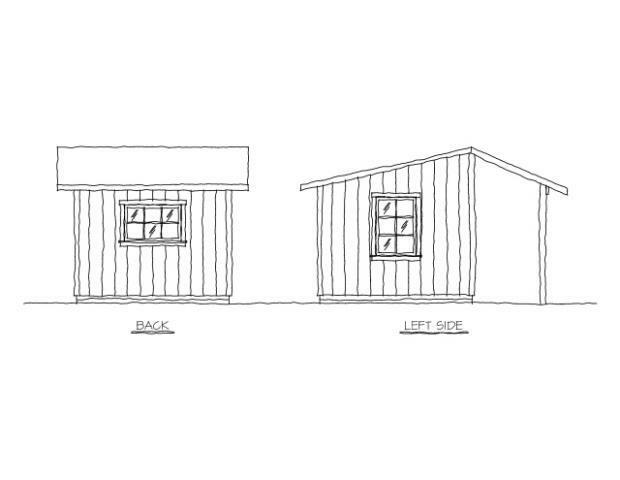 We are in the process of building one now and I'm arguing with the hubby about the windows! I Love yours. I like to reuse items when possible! That is exactly what I was trying to tell my husband we needed to do for the windows! 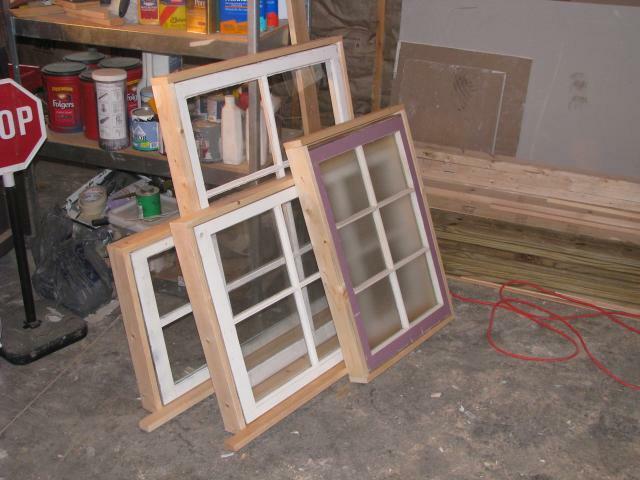 I found old windows for $6.00 apiece at a thrift store but he thinks windows at Home Depot would be more weather proof! ( @ $98.00)! 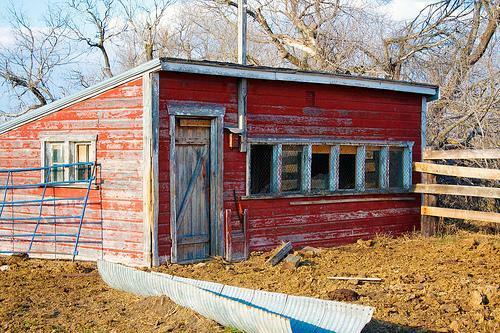 I'm very fond of your chicken coop! The setup is quite lovely. My husband also likes it, so I imagine we'll eventually be trying to duplicate your creation . I"ll be sure and post pictures when and if we ever do. The design you've shared really is perfect because we're from Greenwood, Indiana. I know our winters might be just a shade bit colder than they are in the southern parts of Indiana, but it shouldn't be too much of a difference. 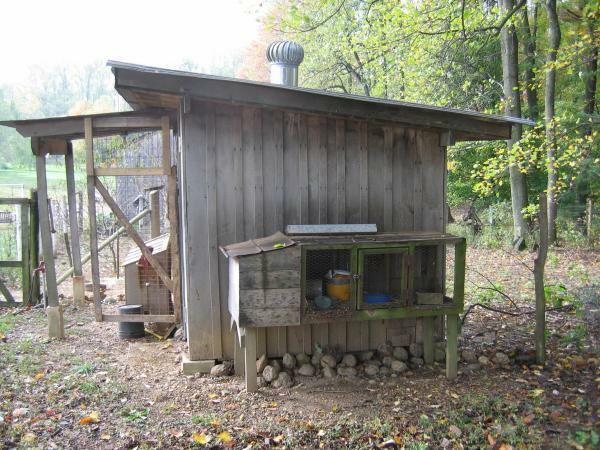 What are the cabinets inside the coop for? Once again, thanks for sharing!!!! Thanks for the comments and feedback! We live in southern Indiana. The temp ranges from 0-100. I left it opened around the roof to allow plenty of ventilation. I was worried about the cold at first, but the chickens have done really well. 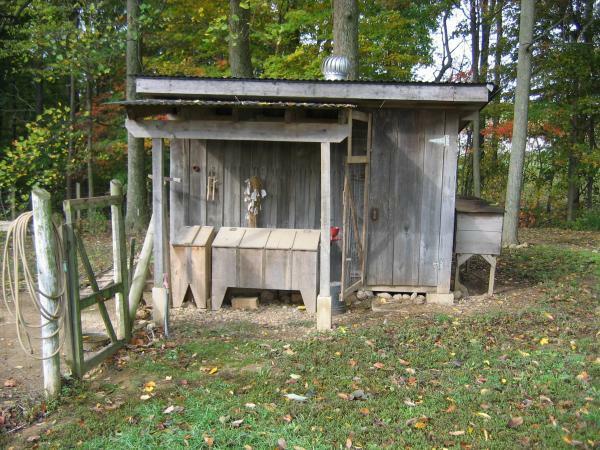 It's been up through two winters now and I haven't lost any chickens due to cold. 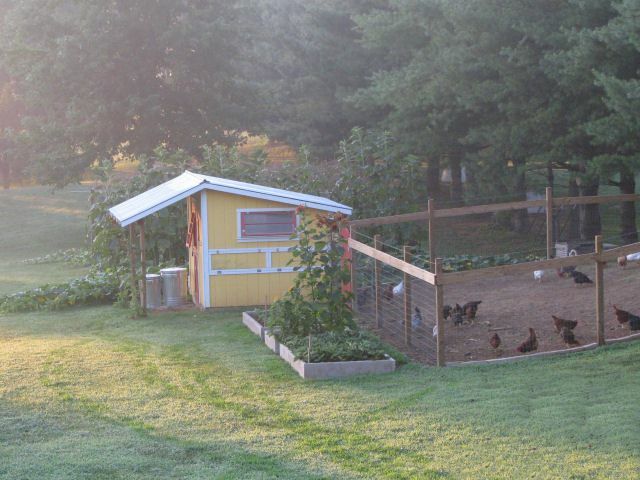 We love the coop, there are a few things I would change though. 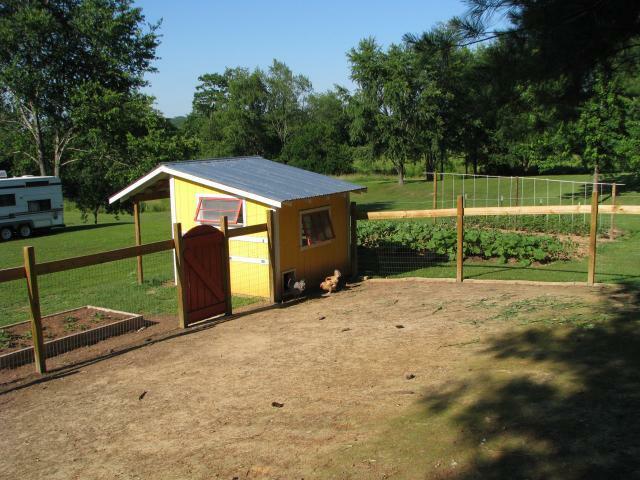 It would definitely be a bit larger, then secondly, I built the chicken run on a part of the yard that has a moderate slope. 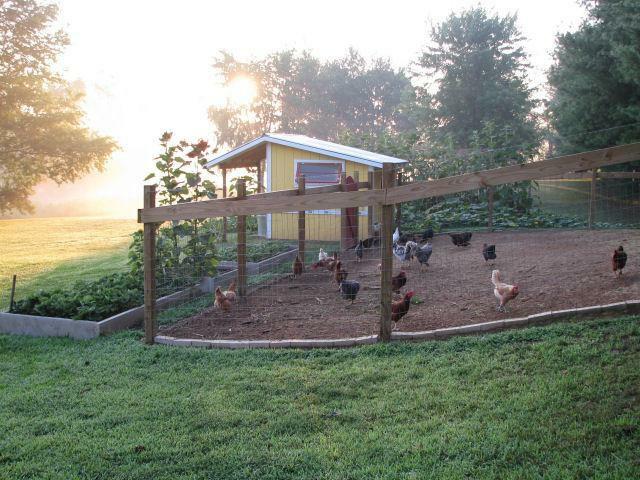 The chickens are constantly scratching the ground, then the rain washes the dirt down toward the coop. So erosion is a problem, I'm not really worried about it though. 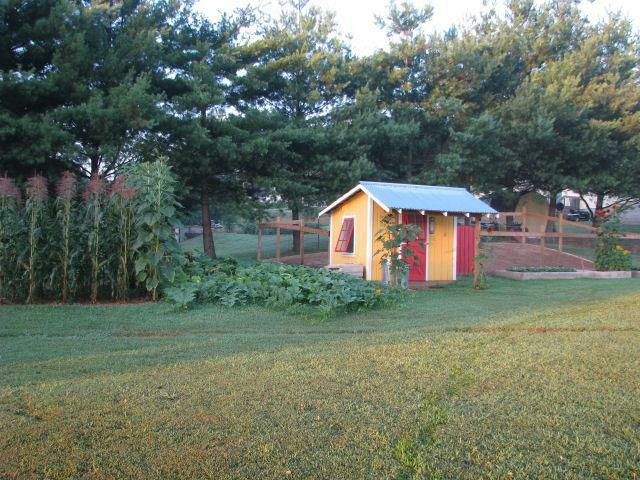 Wonderful coop.Thank you for all the pictures.Love the yard too! I think we will base our new coop after this one. Cute, simple and functional. Wondering where about you live and what kind of weather you have. I noted you didn't insulate. If there was anything you would change about your design now that you have been using?